A professional and patented super powered cordless rechargeable pool vacuum cleaner to clean the swimming pool and SPA. Are you puzzled by countless leaves, tree fruits, hairs, sands into your swimming pools, especially at the beginning of the season, or after a bigger shower ? 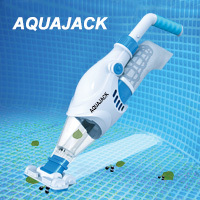 Now, AquaJack coming to efficiently solve your problems, with largest filter bags to catch different kinds of rubbishes, as well as leaf canister holders. Easy to use, holding by the handle, or connecting with the standard pool telescopic poles, just that.